Brenda never meant to become a living vampire. As a matter of fact, she didn't even know that they existed. Her only mistake had been to cross paths with an ancient vampire named Galen. He was charming, educated, and irresistible. In the end, she has been seduced, fed on, transformed, and deceived. Dark Chances is the second book in Galen Vampire series. Allan Gilbreath continues to drive the classic vampire motif to a whole new level. New characters and situations set a fast pace in this novel without the familiar legends losing the distinctive shape that they took in Galen. Gilbreath's astounding attention to detail adds an air of intensity and mystery while keeping the sensual imagery his works are famous for providing to the reader. Allan Gilbreath is known for his ability to link fantasy with danger. He takes the reader into Brenda's struggle to survive and overcome the tremendous obstacles of just living day-to-day. Gaining control of her murderous blood lust is just the first step in her attempts to adjust to the deadly lifestyle forced upon her. 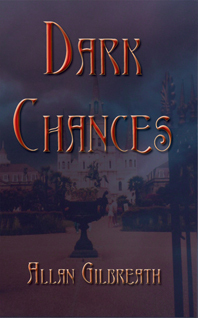 Dark Chances holds great interest for fans of dark fantasy, horror, and paranormal romance.